Nancy White works with organizations to strengthen collaboration and communication online and offline. She has a special interest in online facilitation, teams and communities of practice, and whole systems change. She is about to publish a book with Etienne Wenger and John Smith on stewarding technologies in support of communities and is learning graphic facilitation. Nancy is based in Seattle, Washington in the US. Simone Staiger-Rivas is leader of the Institutional Knowledge Sharing Project. She is a trained social communicator with 13 years’ experience in the coordination of electronic communications projects. Her interest lies in the enhancement of collaboration in institutional settings that contribute to organizational learning and change. Simone is based at CIAT, Colombia. Gauri Salokhe is information professional with 8 years’ experience in information management. She is working on Knowledge Management activities at FAO and has been promoting knowledge sharing through her many projects. Her interests lie in helping develop skills and ideas that encourage and enhance sharing. Gauri is based in Rome, Italy. Peter is an Information and Knowledge Management Specialist at IFPRI. He has a background in soil science, farmer training and environmental education. His responsibilities include managing institutional databases and websites and training research staff in using new information technologies to support their work. Pete is based in Washington, DC in the US. The CGIAR has just launched a new Web system: CGMap at cgmap.cgiar.org from where CGIAR research plans since 2003 can be easily accessed. Each year, all CGIAR Centers look to the future, review research agendas and make adjustment according to the realities of current and expected priorities. This information becomes the basis for the Annual Medium Term Plans (MTPs) for the 15 centers and the Challenge Programs of the CGIAR. This wealth of information is now easily available on line. Full MTP documents are available for download. Here you can browse and download individual projects, overviews and annexes, by Center. The search engine, powered by Google, allows you to search MTP projects and selected CGIAR Web sites. CGIAR System will return results from a broad range of CGIAR Centers and System units Web sites. New functionalities will soon be launched that will help answer specific questions about the CGIAR research agenda, such as how many projects are contributing to a certain system priority, which countries are targeted as potential beneficiary, the related donors and financial information. At the mid-point of the Knowledge Sharing in Research (KSinR) and its 6 Pilot Projects a monitoring and evaluation exercise was carried out to understand projects’ progress, capture any results and lessons, and to plan for the second half of the projects’ time periods. 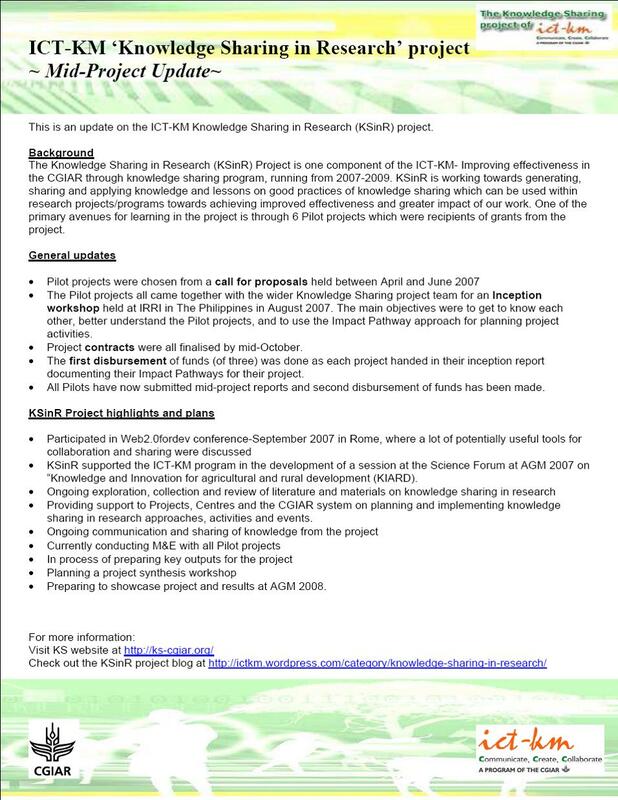 This was done primarily through the submission of Mid-Point project reports (see Documentation and Outputs page for reports) followed up with questions and discussions from the KSinR Project Leader either virtually or via telephone conversation. In some cases an M&E visit has also been carried out with the Pilot Projects…with more to come. The framework and questions for the mid-point report, follow-up discussions and interviews during visits were develope using the Impact Pathways approach, which is being used as the monitoring and evaluation(M&E) and impact assessment methodology for the KSinR project. Discover, understand and apply innovative knowledge sharing approaches to deliver outcomes that have impact! We are very pleased to announce that FAO and the ICT-KM Program are joining forces for the second edition of this workshop, which will offer FAO and CGIAR staff as well as their research partners an opportunity to explore and experiment with knowledge sharing (KS) principles and methods. Through an innovative three phase approach participants will get an understanding and appreciation of the value of KS in research and institutional settings. Dates: Phase 1 (online) starts on September, 8. The face-to-face meeting takes place in Rome, Italy from October 7-9. Phase 3 is online and goes on up to March 2009. Costs: 500 USD. You can choose to participate in phases 1, 1+2, or 1+2+3 of the course. You mustparticipate in phase 1 to participate in phase 2, and both 1 and 2 to participate in phase 3. David Raitzer, Project Leader of the CIFOR KSinR Pilot Project on “Shared learning to enhance research priority assessment practices” will be presenting the work of his Pilot Project on the ‘CGIAR experience on priority setting’ as a valuable knowledge sharing strategy leading to more effective research and impact. The presentation by David will be based on the forthcoming CABI-published book entitled “Prioritizing Agricultural Research for Development: Experience and Lessons” being produced from the Knowledge Sharing in Research Pilot project run by CIFOR. The book, which should be finalized just before the workshop, involves 12 CGIAR IARCs, as well as other partners. This compendium shares experiences and innovations with priority assessment methods in the CGIAR and its partners at various levels, and with respect to a diverse array of research areas. Each chapter presents and appraises one or more methods that have been used to articulate, explore, and assess impact pathways and research priorities in one or more CGIAR centres. Subsequently, each chapter appraises experiences with the methods described, so as to communicate and share strengths and weaknesses encountered for each approach. These chapters are followed by a “synthesis” chapter that draws together real world methodological lessons from the case chapters. 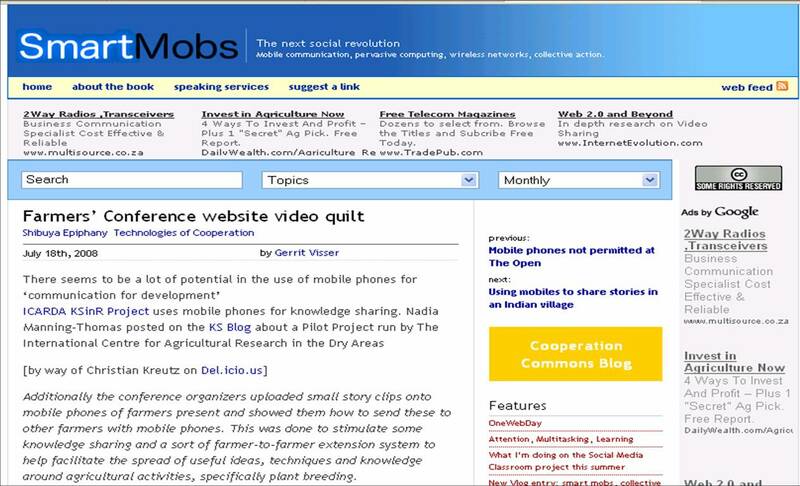 The blog post on July 15th 2008 by Nadia Manning-Thomas entitled ‘ICARDA KSinR project uses mobile phones for knowledge sharing’ has been picked up by various others who are interested in exploring, learning and promoting the value of mobile phones in research and development.